No matter how efficient or technologically advanced your RV heating and air conditioning system, you will still find spaces inside that are colder than others. Keeping an electric heater handy can help you stay toasty warm when your RV’s HVAC can’t keep up. How do you find just the right one? Check out this list of the best electric heaters for use in an RV. The design of this compact electric heater gives it the appearance of an old-fashioned Franklin stove combined with a classic wood-burning chiminea. In addition to its good looks, this space heater can warm even larger spaces in a short time. Keeping warm isn’t a problem either thanks to the oscillating fan and integrated thermostat. The looks, the internal oscillating fan, and the set-and-forget thermostat are all must-have features for any good RV electric heater. The fact it takes up so little space and functions exceptionally well make it an excellent value. Got a small RV room or living space that stays too cold? Plug in your Ontel Handy Heater and warm yourself up in no time. This on-outlet heater is cool to the touch and is perfect for small bedrooms or bathrooms that always seem to stay colder than the rest of the RV in the winter time. It’s a cost effective and elegant solution to keeping small spaces heated. This tiny little heater weighs just over a pound and heats up fast. You can easily plug it in when you hop in the shower and have the whole bathroom toasty warm by the time you finish. The external temp display also helps you keep the room at your desired temperature more easily. Unless you are heating up a small room, this little space heater isn’t going to do much good. It doesn’t have the wattage output to heat up a larger space quickly, and it has no fan to move air through a large space efficiently. Most troubling of all though is the lack of a thermostat: you have to turn it on and off manually to control the temperature. An attractive design with plenty of extra features, the Dr. Infrared DR998 replaces up to four other appliances in your RV: heater, humidifier, air filter, and fan. This diminutive space heater can keep even large RV bedrooms or living areas warm all winter long without drying out the air or triggering your seasonal allergies. There is no feature so underrated and underappreciated like a built-in humidifier. Even if you winter in a warm climate, the dry winter air can make your morning miserable. Additionally, he combination infrared heating and quartz/ceramic elements lets you heat your space faster using less energy. It’s a bit short for an end table or a bedside table, but it can function as one. You will need to put it on top of something else if you want to blow warm, humidified air over your bed while you sleep though. Moreover, the air purifier function needs to be cleaned regularly to be effective. For the space conscious, Caframo offers this low-profile, compact design suitable to every small living space. Under your desk at work, in your RV, or even under your sofa or favorite armchair, the Caframo Limited 9206CABBX True North Heater is ready to provide warmth fast. This thing fits just about anywhere you might want to put it, and if you have an extension cord handy that means it’s tough to find a space it’s not useful. It also keeps small spaces extra warm when you need it, but thanks to its builtin thermostat is shuts off to save power. The is definitely the ugly bug of space heaters. It is definitely functional, but it’s a bit of an eyesore in terms of design. Moreover, the fans don’t oscillate, so you are blasting heat in one direction only while this little space heater is running. It’s fine for small spaces or rooms in RV, but it's not effective otherwise. “No frills, no fancy features, no problems” should be a tagline on the packaging. This heater is a little metal box with four ceramic heating discs, a safety grill, no internal fan, and one of the best thermostats I’ve ever seen in a space heater. This functions on the simple concept of “plug it in and make the room warm.” No second guessing, no fiddling with questions, just plug it in and turn it on for a warm room. After that, it manages the temperature for itself. It looks like a mid-century modern throwback, but ugly. Normally I like this design, but the brown metal box and black grill aren’t doing the looks any favors. It also has no circulating fan, so warming up a room definitely takes longer than with comparable models in the same class. 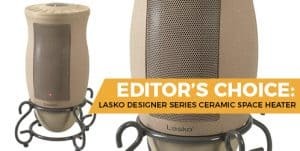 From my research, the best electric heater for your RV is the Lasko Designer Series Ceramic Space Heater. It’s got the best looking and fastest heating with the most efficient design out of the five electric heaters I examined. Plug it in, turn it on, set the thermostat where you want it, and your room is warm and toasty within minutes. Whether you are just an occasional RV traveler or live the RV life full time, this miniature powerhouse heater is going to be the best choice in terms of features, value, and lifespan. Check one out when you go shopping for an electric heater for your RV. I’m confident you will reach the same conclusion.